Grace Slick wrote a fine autobiography and my only criticism of it is that it could have been longer. I enjoyed every word of it. She discussed her good friend Marty Balin in it very often. To Marty Balin, From Everette Hatcher, I love your music, Today I put up a blog post on your good friend Grace Slick. This emphasis on hallucinogenic drugs brought with it many rock groups–for example, Cream, Jefferson Airplane, Grateful Dead, Incredible String Band, Pink Floyd, and Jimi Hendrix. Most of their work was from 1965-1958. The Beatles’Sergeant Pepper’s Lonely Hearts Club Band (1967) also fits here. This disc is a total unity, not just an isolated series of individual songs, and for a time it became the rallying cry for young people throughout the world. As a whole, this music was the vehicle to carry the drug culture and the mentality which went with it across frontiers which were almost impassible by other means of communication. Francis Schaeffer had a lot to say about Rock and Roll, but today I wanted to share with you some comments he made about King Solomon’s BOOK OF ECCLESIASTES. 11 Again I saw that under the sun the race is not to the swift, nor the battle to the strong, nor bread to the wise, nor riches to the intelligent, nor favor to those with knowledge, but time and chance happen to them all. Chance rules. If a man starts out only from himself and works outward it must eventually if he is consistent seem so that only chance rules and naturally in such a setting you can not expect him to have anything else but finally a hate of life. 2 And I thought the dead who are already dead more fortunate than the living who are still alive. 3 But better than both is he who has not yet been and has not seen the evil deeds that are done under the sun. He lays down an order. It is best never have to been. It is better to be dead, and worse to be alive. But like all men and one could think of the face of Vincent Van Gogh in his final paintings as he came to hate life and you watch something die in his self portraits, the dilemma is double because as one is consistent and one sees life as a game of chance, one must come in a way to hate life. Yet at the same time men never get beyond the fear to die. Solomon didn’t either. So you find him in saying this. 14 The wise person has his eyes in his head, but the fool walks in darkness. And yet I perceived that the same event happens to all of them. 15 Then I said in my heart, “What happens to the fool will happen to me also. Why then have I been so very wise?” And I said in my heart that this also is vanity. The Hebrew is stronger than this and it says “it happens EVEN TO ME,” Solomon on the throne, Solomon the universal man. EVEN TO ME, even to Solomon. 12 For man does not know his time. Like fish that are taken in an evil net, and like birds that are caught in a snare, so the children of man are snared at an evil time, when it suddenly falls upon them. Death can come at anytime. Death seen merely by the eye of man between birth and death and UNDER THE SUN. Death too is a thing of chance. Albert Camusspeeding in a car with a pretty girl at his side and then Camus dead. Lawrence of Arabia coming up over a crest of a hill 100 miles per hour on his motorcycle and some boys are standing in the road and Lawrence turns aside and dies. Surely between birth and death these things are chance. Modern man adds something on top of this and that is the understanding that as the individual man will dies by chance so one day the human race will die by chance!!! It is the death of the human race that lands in the hand of chance and that is why men grew sad when they read Nevil Shute’s book ON THE BEACH. Jefferson Airplane, KBC Band, Jefferson Starship, Bodacious D.F. Marty Balin (/ˈbælɪn/; born Martyn Jerel Buchwald; January 30, 1942 – September 27, 2018) was an American singer, songwriter, and musician best known as the founder and one of the lead singers and songwriters of Jefferson Airplane and Jefferson Starship. Balin was born Martyn Jerel Buchwald in Cincinnati, Ohio, the son of Catherine Eugenia “Jean” (née Talbot) and Joseph Buchwald. His paternal grandparents emigrated from Eastern Europe. His father was Jewish and his mother was Episcopalian. Buchwald attended Washington High School in San Francisco, California. In 1962, Buchwald changed his name to Marty Balin, and began recording with Challenge Records, releasing the singles “Nobody But You” and “I Specialize in Love”. By 1964, Balin was leading a folk music quartet called The Town Criers. Balin was the primary founder of Jefferson Airplane, which he “launched” from a restaurant-turned-club he created and named the Matrix, and was also one of its lead vocalists and songwriters from 1965 to 1971. In the group’s famous 1966–1971 iteration, Balin served as co-lead vocalist alongside Grace Slick. While his output diminished after Surrealistic Pillow (1967) as Slick, Kantner, and lead guitarist Jorma Kaukonen matured as songwriters (a process compounded by Balin’s eschewal of the group’s burgeoning “ego trips”), his most enduring songwriting contributions—which were often imbued with a romantic, pop-oriented lilt that was atypical of the band’s characteristic forays into psychedelic rock—include “Comin’ Back to Me” (a folk rock ballad later covered by Ritchie Havens and Rickie Lee Jones), “Today” (a collaboration with Kantner initially written on spec for Tony Bennett that was prominently covered by Tom Scott), and again with Kantner, the topical 1969 top-100 hit “Volunteers.” Although uncharacteristic of his oeuvre, the uptempo “3/5 of a Mile in 10 Seconds” and “Plastic Fantastic Lover” (both written for Surrealistic Pillow) remained integral components of the Airplane’s live set throughout the late 1960s. Balin played with Jefferson Airplane at the Monterey Pop Festival in 1967 and at the Woodstock Festival in 1969. I don’t know, just Janis‘s death. That struck me. It was dark times. Everybody was doing so much drugs and I couldn’t even talk to the band. I was into yoga at the time. I’d given up drinking and I was into totally different area, health foods and getting back to the streets, working with the American Indians. It was getting strange for me. Cocaine was a big deal in those days and I wasn’t a cokie and I couldn’t talk with everybody who had an answer for every goddamn thing, rationalizing everything that happened. I thought it made the music really tight and constrictive and ruined it. So after Janis died, I thought, I’m not gonna go onstage and play that kind of music; I don’t like cocaine. Balin remained active in the San Francisco Bay Area rock scene, managing and producing an album for the Berkeley-based sextet Grootna before briefly joining funk-inflected hard rock ensemble Bodacious DF as lead vocalist on their eponymous 1973 debut album.The following year, Kantner asked Balin to write a song for his new Airplane offshoot group, Jefferson Starship. Together, they wrote the early power ballad “Caroline”, which appeared on the album Dragon Fly with Balin as guest lead vocalist. Rejoining the team he had helped to establish, Balin became a permanent member of Jefferson Starship in 1975; over the next three years, he contributed to and sang lead on four top-20 hits, including “Miracles” (No. 3, a Balin original), “With Your Love” (No. 12, a collaboration between Balin, former Jefferson Airplane drummer Joey Covington, and former Grootna/Bodacious DF lead guitarist Vic Smith), Jesse Barish‘s “Count on Me” (No. 8), and N.Q. Dewey’s “Runaway” (No. 12). Ultimately, Balin’s relationship with the band was beleaguered by interpersonal problems, including Slick’s longstanding alcoholism and his own reluctance toward live performances. He abruptly left the group in October 1978 shortly after Slick’s departure from the band. In 1979, Balin produced a rock opera entitled Rock Justice, about a rock star who was put in jail for failing to produce a hit for his record company, based on his experiences with the lawsuits fought for years with former Jefferson Airplane manager Matthew Katz. The cast recording was produced by Balin, but it did not feature him in performance. Balin continued with EMI as a solo artist and in 1981 he released his first solo album, Balin, featuring two Jesse Barish songs that became top-40 hits, “Hearts” (#8) and “Atlanta Lady (Something About Your Love)” (#27). There was in 1983 a second solo album, Lucky, along with a Japan-only EP produced by EMI called There’s No Shoulder. Balin’s contract with EMI ended shortly thereafter. In 1985, he teamed with Paul Kantner and Jack Casady to form the KBC Band. After the breakup of the KBC band, a 1989 reunion album and tour with Jefferson Airplane followed. 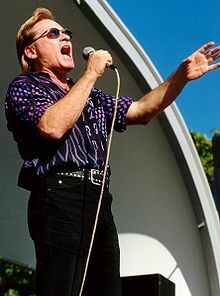 Balin continued recording solo albums in the years following the reunion, and reunited with Kantner in the latest incarnation of Jefferson Starship. Balin had intended to record lead vocals for two tracks for Jefferson Starship’s album, Jefferson’s Tree of Liberty. However, his art touring schedule conflicted with studio sessions, and instead, the track “Maybe for You”, from the German release of Windows of Heaven, was included. On July 2, 2007, the music-publishing firm Bicycle Music, Inc. announced that it had acquired an interest in songs written or performed by Balin, including hits from his days with Jefferson Airplane and Jefferson Starship. Balin, along with the other members of the 1966-1970 line-up of Jefferson Airplane, was inducted into the Rock and Roll Hall of Fame in 1996. As a member of Jefferson Airplane, he was honored with a Grammy Lifetime Achievement Award in 2016. Balin enjoyed painting all his life. He painted many of the most influential musicians of the last half of the 20th century. Marty Balin’s Atelier is located at 130 King Fine Art in Saint Augustine, Florida, Balin’s permanent signature collection gallery. Balin resided in Florida and San Francisco with his wife, Susan Joy Balin, formerly Susan Joy Finkelstein. Together, they had Balin’s daughters Jennifer Edwards and Delaney Balin, and Susan’s daughters Rebekah Geier and Moriah Geier. Jennifer was born later in the year of his 1963 marriage to Victoria Martin. Balin married Karen Deal, Delaney’s mother, in 1989. Karen died in 2010. While on tour in March 2016, Balin was taken to Mount Sinai Beth Israel Hospital in New York City after complaining of chest pains. After undergoing open-heart surgery, he was transferred to an intensive-care unit to spend time recovering. In a subsequent lawsuit, Balin alleged that neglect and inadequate care facilities on the hospital’s behalf had resulted in a paralyzed vocal cord, loss of his left thumb and half of his tongue, bedsores, and kidney damage. Balin died on September 27, 2018 at the age of 76. « Carl Sagan doubted my assertion in 1995 that Richard Dawkins and his humanist friends’ are inseparably linked to the abortion movement!